Keith Curle is backing his Cobblers players to rise to 'the fantastic challenge' of taking on Sky Bet League Two leaders Lincoln City in their own backyard on Saturday (ko 3pm). Town travel to what is expected to be a sold-out Sincil Bank boosted by Tuesday night's much-needed 2-1 win at Tranmere Rovers. It was a result that lifted the gloom following last weekend's 4-0 home humbling at the hands of Colchester United and, more importantly, saw the Cobblers move 10 points clear of the relegation zone. It means the pressure is off in a game that title-chasing Lincoln, who slipped up as they drew 1-1 at rock-bottom Notts County last weekend, will be expected to win, and Curle believes his team can thrive in the role of underdog. 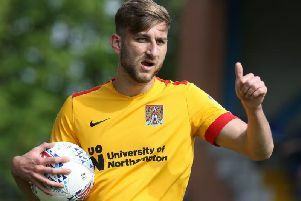 "This is a fantastic challenge for the players, and sometimes the best time to face a challenge like this is after a fantastic victory like the one on Tuesday," said the Cobblers boss. "There is no better time for us to go and play the division's top team, and again the expectation will all be on them. "They had what will be seen as a negative result last week against Notts County, and the expectation from their crowd this weekend will be, 'we only got a point against Notts County, we need to beat Northampton'. "They will have seen the match as a chance to pull away and create a gap, but the nerves at the top can sometimes be as damaging as the nerves down at the bottom. "It is all about how football clubs, teams, players and coaches manage those nerves. "We are playing against the division's top team away from home, and all the expectation will be on them to turn us over. "I think it will be a very, very competitive game."